WIN Say Anything, the award-winning family friendly board game featured in a recent Mommy Blog Expert review that gets everyone to think. This game is non-electronic, making it perfect entertainment and fun for kids and adults getting together at any holiday party and all year round at occasions when family or friends gather. Just leave a comment(s) below this post! Contest ends January 2, 2012 at 12 midnite PST and is open to legal residents of the U.S. only. Winner will be selected at random from all entries and will be notified via email. Thanks to Online-Sweepstakes.com for including this contest in your directory of current giveaways. 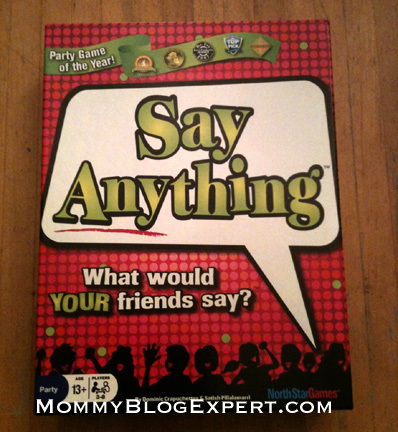 FTC Disclosure: MommyBlogExpert received this game for review on a separate MBE post. NorthStar Games is providing the prize and shipping for this giveaway. I did not receive any other payment or compensation associated with this post. See complete FTC Disclosure information that appears at the bottom of MommyBlogExpert's main page and at the bottom of every individual post on this blog, including this one. How is the game? Did you like it? I want stories!! Should I go out and buy it? This seems like a blurb from the back of the box more than a review. Help us out here! Oh, this was not the review. I got it now. Thanks! How well does the game work when you have multiple couples playing? I would love to win this game because I host a family game night every month and this would be the perfect game to add to the collection. I'd like to win because we need some good board games to play with our friends. I want to win because we just started having a family game night. I want to win because this looks like a game my whole family would enjoy. I want to win this because it would be fun for the whole family. I would like to win because I think this would be a fun addition to family game night. I think that this would be an awesome game to have friends over to play. my friends and i have a monthly game night and we need some new games to play! this one sounds like fun! This looks like a fun game! Thanks for the giveaway! I think this would be fun to play as a family! I actually played this last night on new years eve! I'm always looking for new games, and this looks fun! I want to win this game so I can bring it to game night. Every couple of months my friend hosts a game night for about 10 adults. It's a blast! I want to win because our family loves games and could use a different one! We love to play board games!! I would love to win this to play with my family. I would like to win this for my family game night! My kids love playing games around the fireplace. Always looking for a good new game. I would love to win this to bring to our next family gathering! CONGRATS to Jeni Monroe, You are the Say Anything Game Winner.